Brussels takes the reins of the conflict around immigration policy in the European Union. The president of the European Commission, Jean-Claude Juncker, has convened an informal working meeting with the leaders of eight Member States for next Sunday in Brussels. The objective is to unblock the debate, very tense in recent weeks, to the point of questioning the survival of the German Government itself. "I have convened an informal working meeting on migration and asylum issues on Sunday to work with a group of heads of State and Government of the Member States interested in finding European solutions for the next European Council," Juncker had reported Wednesday through Twitter. It is a mini-summit that will not be attended by all EU members. 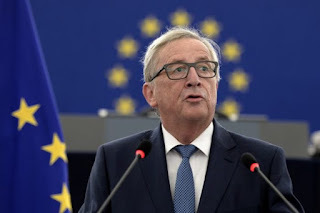 In Juncker's message are labeled the leaders who will participate: the Spanish Pedro Sánchez -who will debut at a European meeting-, the Frenchman Emmanuel Macron, the Austrian Sebastian Kurz, the German Angela Merkel, the Greek Alexis Tsipras, the Italian Giuseppe Conte , the Maltese Joseph Muscat and the Bulgarian Boyko Borissov. This list aims to bring together the countries suffering from the pressure of arrivals in the south (Italy, Greece, Spain and Malta) with Germany, recipient of a large part of the internal flows, and with the two presidencies of the EU: Bulgaria ( the current one) and Austria (the one that will exercise from July 1). That extraordinary meeting, just four days away from the ordinary summit to be held by the twenty-eight with migration as one of the strong points, seeks to find informal arrangements that can be applied quickly, outside of community decision-making procedures. The Community Executive will offer a solution that will satisfy the countries most affected by the rise in political tone. Mainly for Germany, where Horst Seehofer, Minister of the Interior and Bavarian partner of the German government coalition, has threatened Merkel with closing the way for asylum seekers who intend to enter the country after applying for protection in another EU state. The chancellor stopped the unilateral measure, which could unleash a chain of national responses in the community club, in exchange for a common solution in Brussels. Italy, meanwhile, has shaken the European scene by refusing to open its ports to the ship Aquarius, loaded with more than 600 migrants and ending at the port of Valencia. Brussels hopes to be able to string together a formula that is acceptable to all. On the one hand, that limits the transit of asylum seekers to Germany (today much lower than the peak of the migration crisis, in 2015). On the other hand, that gives air to Italy in the responsibility that today assumes to disembark practically all the ships rescued in the central Mediterranean. The initiative of the Commission, however, has annoyed the institution that represents the States and that normally hosts all its meetings, the European Council.